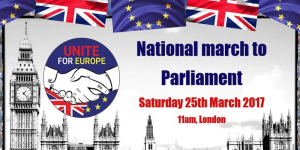 The Unite for Europe march organised for Saturday 25 March 2017 in London is an important opportunity for concerned citizens to come together – as they did for the last March for Europe on 3 September 2016. It is a march of many things for many people. A march of protest, of solidarity, of regret, of passion but most importantly – this march is your democratic right to voice your opinion. Like organisations, few marches can boast that all their participants share exactly the same views, are 100% unified and support every single “key message”. The spectrum of opinion on Brexit and what should happen next is growing by the day. People across the country voted for and against Brexit for a huge range of reasons so it would be impossible for everyone to now completely agree on a way forward. 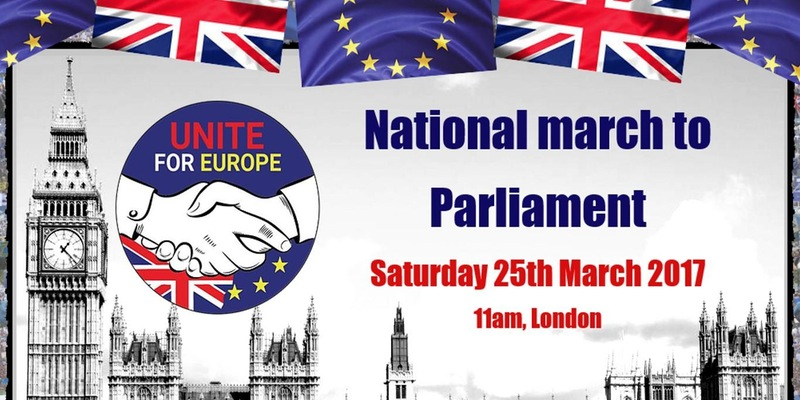 The Unite for Europe march doesn’t seek to unite everyone around a single solution or to speak with a single voice – but to unite people around the many opinions, concerns and fears that – the result of an oversimplified advisory referendum has given the government the green light to negotiate a hard, punishing Brexit, regardless of the impact that it will have on the future of the United Kingdom. The march for Europe is an opportunity for YOU to take advantage of your democratic right to have your say on an issue which will impact the whole country for generations to come. There are countless examples of how Vote Leave went beyond the normal bounds of political campaigning, from misleading public about our contribution to the EU budget, conjuring fears about Turkey joining the EU or spreading blatant lies such as “the UK has no border controls whilst in the EU” when billions are spent on the UK Border Agency. And let’s never ever forget about THAT bus. These are messages that not only should not be forgotten but need to be continuously challenged and countered. Many of the politicians that helped to promote these lies are not only still in office but some are now leading Brexit negotiations, and continuing to deceive. We have to continue to hold them to account for misleading the British people. But more importantly, we have to remind the government that it was elected to represent all British people and it cannot continue to ignore the 16.1 million people that vote to Remain in the EU. We also have to remind them that almost 30% didn’t vote in the referendum and millions of young people who will have to live with the consequences of Brexit didn’t have the right to vote. 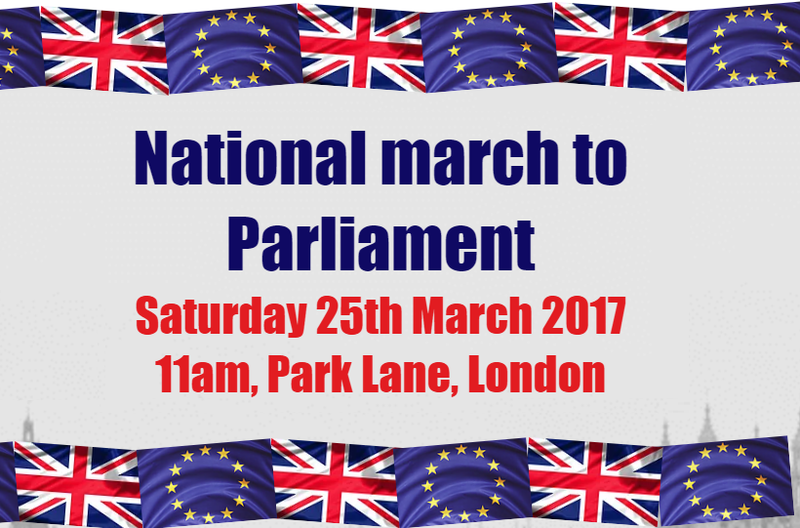 This march for Europe is YOUR chance to remind the government that it will be held to account. Since the EU referendum, pro-European grassroots groups have been springing up across the country – wanting to defend Britain’s place in Europe. Many are cross-party or non-partisan but are united in their belief that the 23rd June referendum did not settle everything and it did not provide mandate for a hard Brexit. The consequences of Brexit will vary across the country but it is important for pro-European groups to continue to support and encourage each other and, not fall into indifference. The majority of MPs were not in favour of Brexit. The majority – across the political spectrum (including our Prime Minister!) – campaigned for us to remain in the EU. In the age of social media, many politicians face daily abuse and even threats from people who disagree with them. This includes those who refuse to stand down and simply accept any Brexit deal that is negotiated – or not negotiated. The general public cannot be left to will grow weary and indifferent to Brexit – which is why we must support MPs and other decision makers who continue to raise concerns and question decisions which will mean Britain will be worse off. The United for Europe march will reflect the diversity of opinion on a lot of things but we will all march united to show that we cannot and will not be ignored on the European future of our country.